To foster future growth while preserving the rural character of the community through partnerships with the community, developers, and interested parties that wish to benefit the citizenry of Semmes and the City as a whole. To ensure the growth of the community is applicably supported by the communities’ infrastructure such as public safety, parks and recreation, utilities, traffic, through intense research and fact finding endeavors. Click on the link the view the schedule for application deadlines, planning commission meetings, and response times. *Please call to schedule a Project Proposal Conference before submitting your application. This meeting is at no charge to you and gives you the opportunity to meet with members of the Planning Staff for guidance on the Subdivision Regulations and the process to follow. All PPCs should be scheduled with Jason Franklin, Public Works Superintendent at 251-649-5752. PPCs are held each Tuesday at 1:00 PM, 2:00 PM, & 3:00 PM. NO way restrict the use or ownership of any parcel of land. 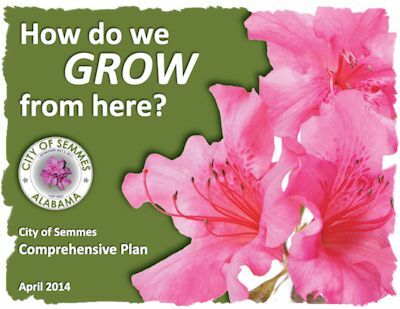 The Comprehensive Plan is just that – a reflection of the desires and aspirations of our Semmes Community that defines our goals and objectives. 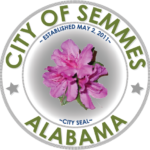 It will be used as a roadmap to guide the City into the future with all considerations given to the ideas and suggestions received from the Semmes Community via Town Hall Meetings that were held. Only the CITY COUNCIL can adopt a “zoning ordinance” – not the Planning Commission.